The President’s Distinguished Speaker Series featuring Chris Herren on Tuesday, March 26, 2013. The event will take place in the Horace Mann Auditorium at 7:00pm. Reservations are on a first-come, first-served basis and can be made by emailing RSVPPresEvents@bridgew.edu or calling (508) 531-6123. 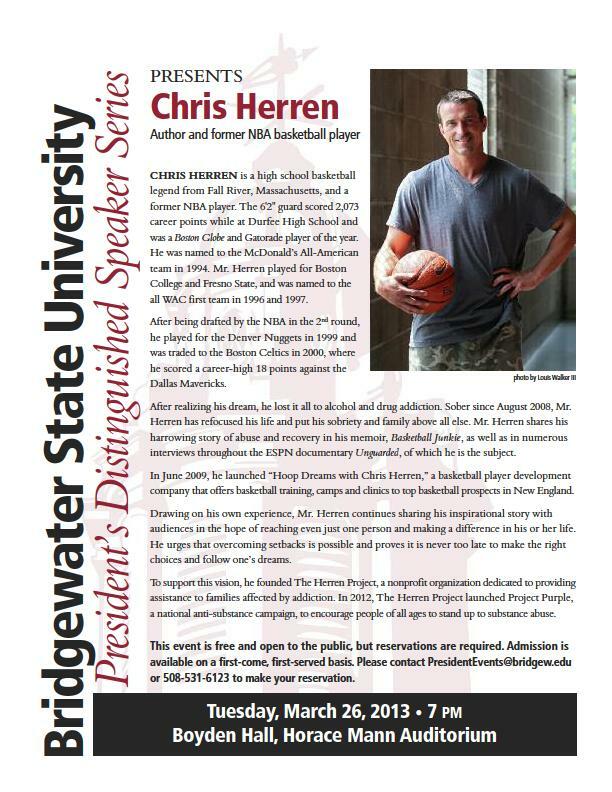 Mr. Herren is an author and former NBA basketball player who lost everything to addiction. He has since committed his life to sobriety and his family and speaks about the dangers of addiction and urges audiences it is never too late to make a change in one’s life or pursue one’s dreams.